The Taiwan passport (Chinese: 中華民國護照; pinyin: Zhōnghuá Mínguó hùzhào) is the passport issued to nationals of the Republic of China (ROC), commonly known as Taiwan. The passport is also commonly referred to as a Taiwanese passport. The status and international recognition of the ROC passport is complicated due to the political status of Taiwan. The Nationality Law of the Republic of China considers not only residents of Taiwan, Penghu, Kinmen, and Matsu, but eligible overseas Chinese and Chinese residents of Mainland China, Hong Kong, and Macau to be nationals of the Republic of China. It is worth noting that the vast majority of Chinese-descent residents in Hong Kong, Macau or Mainland China are also nationals of the People's Republic of China (PRC) and do not hold any identification documents issued by the ROC. Individuals in the latter two categories may be eligible for a ROC passport under certain conditions, but do not have household registration in Taiwan (i.e. they are "nationals without household registration", or "NWOHR"), and thus do not enjoy the right of abode in Taiwan. [a] Countries granting visa-free privileges to Taiwan passport holders often require a Taiwanese National ID number imprinted on the passport's biodata page, which signifies the holder's right of abode in Taiwan. The Taiwanese passport is one of five passports with the most improved rating globally since 2006 in terms of the number of countries that its holders may visit without a visa. The first generation biometric passports were introduced on 29 December 2008. Taiwan became the 60th country in the world to issue biometric passports when they were introduced. The cover of the ordinary Taiwan passport is dark green, with the ROC national emblem – Blue Sky with a White Sun - in the middle. On the top is the official name of the country, "REPUBLIC OF CHINA", in both Traditional Chinese characters and English. Below the national emblem, the word "TAIWAN" is printed in English only and "PASSPORT" is printed in both Traditional Chinese and English. At the bottom is the biometric passport symbol ( ). The cover of the official passport is brown and has the words "OFFICIAL PASSPORT" on the cover, and the diplomatic passport is dark blue with "DIPLOMATIC PASSPORT" on the cover. The first page of the passport is the passport note page and printed with the following request, anti-counterfeiting printing shows the shape of the island of Taiwan at the top and word TAIWAN at the bottom. Request page of a Republic of China passport. REPUBLIC OF CHINA 身分證統一編號/Personal Id. No. Personal biodata page information for the passport holder and the machine readable zone are listed below. Authority MINISTRY OF FOREIGN AFFAIRS for passports issued by the MOFA, or the name of the issuing diplomatic mission for passports issued by a Taiwanese mission abroad. All biometric passports are issued by the MOFA in Taiwan regardless of the actual place of application. The biodata page is protected by a plastic anti-counterfeiting layer with laser holograms of the country code TWN and broad-tailed swallowtail butterfly, an endemic species of Taiwan. Selected nature hotspots and famous sights of Taiwan are printed in the inner pages, each page also contains a transparent watermark of Jade Mountain, the highest peak of the country. A contactless biometric chip is embedded in the back cover page, with the warning as follows. This passport contains a sensitive electronic chip, and should be treated with great care in the same way as a portable electronic device. For best performance, please do not bend, twist, perforate or staple the passport. Neither expose it to direct sunlight, extreme temperature or humidity. Avoid electro-magnetic fields or chemical substance. The second generation biometric passport has been issued since 5 February 2018. It was originally scheduled to be rolled out on 25 December 2017, however the rollout was suspended a day later and did not resume until 5 February 2018 due to the Dulles Airport image controversy. Military service uncompleted remarks on the remarks page. Notice of the departure for the man at conscription age on the back cover. First time applicants are required to submit their documents in person to the BOCA headquarters or a BOCA branch. Processing time: Four working days. Validity period: Starting from 21 May 2000, validity period for an ordinary passport is generally 10 years and 1 day. For applicant aged under 15 is 5 years. For the male citizens who have not complete his conscription duty is 3 years. Application fee: Effective since 1 January 2013, the application fee for a 10-year passport is NT$1,300, for a passport with restricted validity period is NT$900. In comparison, the cost of manufacturing a passport is NT$1,361, regardless of the validity period. Due to mandatory military service for men, travel restrictions are placed on male citizens from the age of 15 until they have completed their military service. When a passport is issued to a such citizen, a stamp with the following words will be shown on the remarks page, and a sticker which describes the regulation will be attached to the back cover of the passport. Translation: The bearer needs a permission to travel abroad and has not yet completed his military service. Before travelling, the holder needs to apply for permission to travel overseas with the National Immigration Agency or the conscription administration near his residence. Permission is granted in the form of a stamp on the remarks page, including the expiration date and the issuing authority. The ROC passport of a national without household registration does not have an identification card number listed on its data pages in the empty spaces labelled (1). Around 60,000 Taiwan passport holders are NWOHRs, accounting for approximately 0.5% of total valid passports. NWOHRs are overseas nationals without household registration in Taiwan, and hence do not have the right of abode in Taiwan, Penghu, Kinmen, Matsu and other outlying islands. Overseas nationals can only apply for a passport from an embassy, consulate or Taipei Economic and Cultural Representative Office near their residing country with the following document. The Republic of China nationality law adopts the jus sanguinis principle. The applicant's nationality may be established through ancestral ties. Various documents may be used as proof, see the eligibility paragraph for more information thereto. Application fee: For a 10-year passport is US$45, for a passport with restricted validity period is US$31. Unlike residents of Taiwan, NWOHRs do not automatically have right of abode in Taiwan. They are required to apply for an entry permit to enter Taiwan prior to their travel if they are not exempted. The application must be submitted to the embassy, consulate or Taipei Economic and Cultural Representative Office of their country of residence. Once application is approved, a visa-like permit will be affixed on the visa page. This legal situation is rather similar to that of British Overseas Citizens, who have no automatic right of abode in the United Kingdom or any other British dependency or territory. 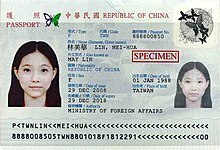 In the United States, passports without a National ID number (without unrestricted right to enter and/or reside in Taiwan) do not satisfy the definition of a passport under INA 101(a)(30). Therefore, the bearers of such passports are considered stateless for visa issuing purposes. Because of the lack of right of abode, page 50 of NWOHR passports show the following words in ink. Translation: "This passport is not eligible for visa waiver programs of some countries according to their regulations." Unlike passports of Taiwanese residents, passports for NWOHRs contain a special stamp that indicates non-resident status and exempts holders from conscription. The ROC was founded in 1912 governing Mainland China. The earliest verifiable ROC passports were issued by the Beiyang Government in Beijing in September 1919, and an ROC passport booklet was first issued by Beiyang Foreign Minister Wellington Koo Wei-chun in April 1922. At the end of the Second World War in 1945, the Republic of China was given administrative jurisdiction over Taiwan and maintained control of it ever since. At the end of the Chinese Civil War in 1949, the ROC lost its control of Mainland China to the Chinese Communist Party, which established the People's Republic of China (PRC). Henceforth, the ROC has been able to administer only Taiwan and some islands off the Mainland's coast. Maintaining the view that it is still the legitimate government of the whole of China, the ROC does not formally recognize the legitimacy of PRC. It has also constitutionally defined all the territory under its control as the "Free Area" (or the "Taiwan Area") and the territory outside Taiwan Area as the "Mainland Area". The ROC constitution allows the ROC government to make laws for one Area of the country without affecting the other Area.. Proof of ROC nationality for a parent or ancestor, together with proof of descent. As the first ROC nationality law, in effect from 5 February 1929 to 9 February 2000, only permitted ROC national fathers to pass nationality down to the descendants, any person who was born on or before 9 February 1980 to an ROC national mother and a foreign father is not a ROC national, regardless of place of birth. There are certain exceptions to this in certain cases for first and second generation emigrants, but in general an applicant will be unable to obtain a ROC passport unless he already holds ROC-issued nationality documentation for himself or an ancestor. The person has an ancestor in one of the previous categories (i.e. the ancestor actually obtained the ROC document, as opposed to merely having the right to do so), and the chain of descent is through the male line until the 1980s. The interior is in traditional Chinese characters and English. Until the mid-1990s, the passport also contained an entry for provincial ancestry (籍貫), stating the Chinese province and county of one's ancestral home, but this field has been eliminated. However, the Chinese province or county of birth is still listed in the birthplace entry if the passport holder was born in either Mainland China or Taiwan. Visa requirements for Taiwan passport holders are administrative entry restrictions by the authorities of other states placed on nationals of Taiwan. As of 17 February 2019, holders of ordinary Taiwan passports (for ROC nationals with Taiwan area household registration who therefore possess right of abode in Taiwan and also the right to obtain a National Identity Card) had visa-free or visa on arrival access to 149 countries and territories, ranking the Taiwan passport 26th in the world in terms of travel freedom (tied with the Costa Rican passport) according to the Henley Passport Index. [b] Additionally, Arton Capital's Passport Index ranked the ordinary Taiwan passport 27th in the world in terms of travel freedom, with a visa-free score of 130 (tied with Panamanian and Paraguayan passports), as of 17 February 2019. Visa requirements for ROC nationals without household registration (NWOHR), i.e., nationals of Taiwan who do not possess right of abode in Taiwan and hence ineligible for a National Identity Card, are different. Unlike ROC nationals with household registration in Taiwan, NWOHRs cannot apply for the Australian Electronic Travel Authority (ETA) and must instead apply for a subclass 600 visa in order to visit Australia. NWOHRs also require visas to visit Canada, Japan, New Zealand, the Schengen Area (including future member states Romania, Bulgaria, Croatia and Cyprus), the United Kingdom and the United States (where NWOHRs are considered stateless and their visas issued on a separate form). Even though the Republic of China maintains official relations with only 17 countries, the ROC passport is still accepted as a valid travel document in most countries of the world. Although Taiwanese enjoy visa-free status in 148 countries, some countries, pursuant to their positions on Taiwan's political status, refuse to visé or stamp ROC passports, and instead issue visas on a separate travel document or a separate piece of paper to Taiwanese travelers to avoid conveying any kind of recognition to the ROC, or to Taiwan as a polity distinct from the PRC. The chart below only lists countries or territories which explicitly state that ROC passports are not accepted, while also requiring a visa or entry permit for ROC nationals prior to arrival. Argentina Visitor permit issued in a separate paper. China (Mainland) ROC passports are not recognized or accepted. ROC nationals with right of abode in Taiwan are required to apply for a Mainland Travel Permit for Taiwan Residents (a credit card sized travel document). For those without right of abode in Taiwan, a passport-like Chinese Travel Document is required. Georgia ROC nationals are not allowed to enter or transit. Hong Kong ROC nationals with right of abode in Taiwan are required to either use their Mainland Travel Permit for Taiwan Residents, or complete a Pre-arrival Registration for Taiwan Residents online. For those without right of abode in Taiwan, a Chinese Travel Document with a Hong Kong SAR Entry Permit is required. Jamaica ROC passports are not recognized. Must hold an Affidavit of Identity issued by Jamaica. In 2015, a pro-independence activist, Denis Chen, designed the Taiwan Passport Sticker (Republic of Taiwan sticker) to be placed on the front cover of ROC passports. The stickers re-brand the country's name as "台灣國" (literally, State of Taiwan) and "Republic of Taiwan" , as well as replacing the existing national emblem of a Blue Sky with a White Sun with cartoons of either Jade Mountain, Formosan black bear, or pro-democracy activist Cheng Nan-jung. Although applauded by pro-independence supporters, this move caused controversies in Taiwan's neighboring countries and regions, as well as the United States, since the alteration of passport covers might be a violation of immigration laws in other countries or regions and eventually cause the refusal of entry to holders of such passports. Singapore was the first country in Asia to deny entry to holders of altered passports on 29 November 2015, and deported three ROC nationals for "altering their travel documents". Among the three, two immediately removed the Republic of Taiwan stickers upon the further inquiries by the Immigration and Checkpoints Authority (ICA) officers, but were eventually deported by Singapore to Taiwan. Another person had refused to remove such stickers and instead requested diplomatic representatives of Taiwan for consular protection, but was also deported in the end by ICA. The two Special Administrative Regions of China, Hong Kong and Macau, soon followed suit and refused to accept holders of such passports for entry. A spokesperson of Hong Kong Immigration Department said that any person who "altered the travel document without lawful authority, or, who possess or use altered travel document", is a violation of Immigration Ordinance and can be sentenced for up to 14 years in prison. The American Institute in Taiwan (AIT) had, through diplomatic channels, notified the MOFA and confirmed that holders of such altered passports may be extensively questioned by the U.S. Customs and Border Protection (CBP) officers and be removed from the United States, and on March 2016, two travelers from Taiwan voluntarily removed Republic of Taiwan stickers because of the extensive questioning by CBP officers. The two travelers were eventually admitted into the U.S., while a CBP spokesperson warned that alterations of travel documents made by any person who is not authorized by the government of a country can render it invalid and will result the holder's refusal of admission to the U.S., and placing Republic of Taiwan stickers on passports is deemed to have altered the travel documents. Similar incident also occurred in Japan when a holder of altered passport was taken to secondary inspection. After being told that he would be deported, the man finally removed the Republic of Taiwan stickers and placed them on his T-shirt and was allowed into Japan. Supporters of the stickers claimed that passports with Republic of Taiwan stickers were accepted in the United Arab Emirates and in Japan. In the latter case, the person who placed Republic of Taiwan sticker claimed that he was simply trying to block the word "China" from his passport. Holders of such passports were also allowed entry in Philippines, although a Bureau of Immigration (BI) spokesperson claimed that the passenger would normally be thoroughly inspected and called the incident "a serious matter", while also said that the government would launch an investigation. According to the BOCA, a total of 21 people had been denied entry by Singapore, Macau and Hong Kong since the end of 2015. Also, incidents were reported in Japan and U.S. of the use of Republic of Taiwan stickers. The MOFA called upon travelers to not alter the cover of their travel documents so that they would not be denied entry. The image of Washington Dulles International Airport in page 5 of the first batch of the second-generation ROC passport (top), in comparison to the actual Saarinen-designed Dulles terminal building and control tower (bottom-left) and Lin-designed Taoyuan Terminal 1 (bottom-right). Page 5 of the redesigned second generation biometric passport, originally scheduled to roll out on 25 December 2017, was to feature an image of the iconic terminal 1 of Taiwan Taoyuan International Airport, a project of Chinese-American architect Tung-Yen Lin completed in 1979. On the same day, however, netizens on Facebook noticed that a picture of the terminal building of Washington Dulles International Airport was used on page 5 instead. Dulles's terminal, which was completed in 1962 and designed by renowned architect Eero Saarinen, had greatly inspired Lin's design of terminal 1, hence the two buildings bear a high degree of similarity. The MOFA initially dismissed the reports in the morning of 26 December when a spokesperson of the ministry claimed that the photo was taken at Taoyuan Airport. Nearly 12 hours would pass before the MOFA acknowledged the error and stated that over 220,000 new passports were printed and delivered by the Central Engraving and Printing Plant (CEPP) and 285 of them, which were already recalled, had been delivered to applicants by the time the mistake was discovered. BOCA chief Agnes Chen took responsibility and resigned on 27 December as the rollout of the new passport was halted, and applicants were issued first generation biometric passports instead. It was later reported that an extra 330,000 undelivered blank booklets were already printed by the CEPP, bringing the number of total affected booklets to more than 550,000, and destroying those would cost the government NT$220 million. To reduce costs, the MOFA decided to print new stickers with the correct building which would cover page 5 and turn it into a travel warnings page from a blank amendment/endorsement page, a move that will set back a much lower NT$16 million. In January 2018, the CEPP had also agreed to cover the NT$9.9 million manufacturing cost of the undelivered 330,000 booklets. The second generation biometric passport with stickers on page 5 was officially rolled out on 5 February 2018, more than a month behind the original schedule, thus placating the controversy. MOFA confirmed that it had notified immigration authorities of foreign countries so that holders of passports with the sticker would not encounter difficulties when traveling. Two months later in April 2018, the Control Yuan had released a report on the incident, in which it placed the majority of the blame on the BOCA passport design group and group members' carelessness when researching images for the terminal. The report also highlighted the lack of communication between the BOCA and the CEPP, which failed to exercise due diligence on copyright issues and did not independently verify the correctness of the image due to the BOCA's status as a long-time customer. The report also strongly condemned the MOFA's initial dismissal of the incident. On 4 May 2018, the BOCA announced that it had estimated that the initial stock of the 550,000 booklets with the sticker would be depleted by mid-May, and the new version without the sticker on page 5 would then be issued. The sticker-less version would continue to feature page 5, which now bears the correct terminal building, as a travel warnings page rather than an amendment/endorsement page. A Republic of China passport booklet issued during the Beiyang-era in the 1920s. A Republic of China diplomatic passport issued during World War II. A Republic of China passport issued in 1946. A Republic of China passport issued in 1982. A machine-readable, non-biometric Republic of China passport issued in 2006. ^ Lack of right of abode means that the passport holder cannot be deported to the issuing country of the passport. Similar examples include British Overseas Citizens who do not have the right of abode in the United Kingdom. ^ The Republic of China Ministry of Foreign Affairs, however, lists 167 countries with visa-free or visa on arrival access, which included a large number of countries requiring pre-arrival documentations such as invitations or visa approval letters (such as Kazakhstan, Uzbekistan and Vietnam). Such countries are not considered as providing visa-free or visa-on-arrival access, since the visa is usually approved before arrival and during the process of obtaining such documentations. ^ Cheng Hsu-kai (December 2, 2007). "St. Lucia customs woes show utility of new passport". Taipei Times. p. 3. Retrieved September 8, 2008. ^ "Taiwanese Passport Move Denounced". China Internet Information Center. June 14, 2003. Retrieved 2008-09-08. ^ "Taiwan passport change angers China". BBC News Online. 13 January 2002. Retrieved 2008-09-08. ^ "ISECO-Israel Economic and Cultural Office in Taipei". Iseco.org.tw. Archived from the original on 2004-12-31. Retrieved 2008-09-08. ^ Roger Mark Selya, Development and Demographic Change in Taiwan (World Scientific, 2004), p. 329. ^ a b "國內要聞 - 聯合新聞網". 16 July 2012. Archived from the original on 16 July 2012. ^ "台灣新版護照封面 將加註ISSUED IN TAIWAN 字樣 (The new version of the passport cover in Taiwan will be marked with an "issued in Taiwan" remark)". Epoch Times (in Chinese). January 14, 2002. ^ 外交部領事事務局 (2017-07-31). "Bureau of Consular Affairs, Ministry of Foreign Affairs, Republic of China(Taiwan)". MOFA to start issuing next-generation e-Passports on February 5. Retrieved 2018-03-14. ^ "MOFA to introduce next-generation e-Passport - News and Events - Ministry of Foreign Affairs, Republic of China (Taiwan) 中華民國外交部 - 全球資訊網英文網". Ministry of Foreign Affairs, Republic of China (Taiwan) 中華民國外交部 - 全球資訊網英文網. Retrieved 2018-03-24. ^ a b "Passport Application Fees". Bureau of Consular Affairs. January 1, 2013. ^ "Foreign Ministry opposes lower passport application fee". ^ "Enforcement Rules of the Passport Act". Retrieved April 27, 2011. ^ "韓華僑拿我護照無免簽 盼政府改善 - 生活 - 自由時報電子報". Liberty Times (in Chinese). 16 April 2013. Retrieved 31 July 2018. ^ "Passport Act". Retrieved September 9, 2012. ^ a b c "Enforcement Rules of the Passport Act". Retrieved September 9, 2012. ^ "Determination of ROC nationality". ^ "Electronic Travel Authorities (ETA)". Australian Consulate-General, Hong Kong. Retrieved 1 December 2018. ^ "Taiwan Reciprocity Schedule". Travel.state.gov. Department of State. Retrieved 1 December 2018. ^ 三立新聞網. "「台灣國」貼紙遭星國拒絕入境 網友：愛貼就要負起責任 - 政治 - 三立新聞網 SETN.COM". ^ 三立新聞網. "護照貼台灣國遭拘留？黃暐瀚：為何向不認同的外交部求救？ - 政治 - 三立新聞網 SETN.COM". ^ "貼台灣國遭澳門遣返 他說「不會放棄愛台灣的心」 - 政治 - 自由時報電子報". ^ "台湾旅客持"台湾国贴纸护照"被港遣返". 1 March 2016. ^ "Two Taiwan visitors refused permission to land - Immigration Department". www.immd.gov.hk. ^ 三立新聞網. "拒絕入境！護照不准貼「台灣國」 連AIT都說要撕掉 - 生活 - 三立新聞網 SETN.COM". ^ "世界新聞網 - World Journal,世界新聞網,worldjournal.com,北美,North America,新聞,news,華人,Chinese,網路新聞,頭條,即時,要聞,美國,中國,台灣,香港,國際,醫藥,健康,移民,法律,紐約,舊金山,洛杉磯,溫哥華,多倫多,地產,房市,教育,升學,NY,LA,SF". 世界新聞網. ^ "台灣國護照貼紙被禁 可是這國家一口氣貼3張... - 政治 - 自由時報電子報". ^ "護照貼「台灣國」赴日險被攔 民眾質疑… - 生活 - 自由時報電子報". ^ "護照貼「台灣國」入境 菲移民局：不宜 - 重點新聞 - 中央社即時新聞 CNA NEWS". ^ "外交部呼籲國人切勿改變護照原狀以確保旅行權益 - 外交部領事事務局全球資訊網". www.boca.gov.tw. ^ "獨／新護照內頁底圖疑美國機場 網友：台灣成美第51州？". Udn.com. 26 December 2017. Retrieved 23 October 2018. ^ Moyer, Justin Wm (28 December 2017). "Taiwan mistakenly prints 200,000 passports featuring the image of Dulles airport". The Washington Post. Retrieved 22 October 2018. ^ "Regeneration of Taoyuan International Airport Terminal 1 by Norihiko Dan and Associates". ArchDaily. ^ "本部單位主管例行新聞說明會紀要---NGO". Ministry of Foreign Affairs. Retrieved 23 October 2018. ^ "護照錯很大 外交部12小時才認了". 26 December 2017. Retrieved 23 October 2018. ^ Yeh, Joseph (27 December 2017). "Consular affairs chief resigns over passport fiasco". Focus Taiwan. Retrieved 22 October 2018. ^ Yeh, Joseph (31 December 2018). "MOFA to put stickers on e-passport to cover Dulles Airport image". Focus Taiwan. Retrieved 23 October 2018. ^ Yeh, Joseph (24 January 2018). "MOFA unveils sticker on e-passport to cover Dulles Airport image". Focus Taiwan. Retrieved 23 October 2018. ^ "台灣二代晶片護照製作出錯 2月5日重新發行". On.cc. Retrieved 23 October 2018. ^ "第二代晶片護照誤用外國機場意象圖 重創國家形象案 監察院促請外交部、中央印製廠檢討改善". Control Yuan. Retrieved 23 October 2018. ^ "全新版二代晶片護照5月中發行". Taro News. 4 May 2018. Retrieved 23 October 2018. This page was last edited on 6 April 2019, at 05:03 (UTC).